With the number of volunteer events available through UNT SWE, there is a diverse, vast amount of people eligible to sign up as UNT SWE volunteers. 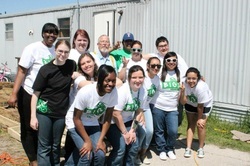 All UNT SWE members are eligible to volunteer for events. We ask that all members that wish to volunteer are in good standing with the University. People outside the UNT SWE membership are also eligible to volunteer, we simply ask that the full name and current email address of these volunteers are provided. Some outreach opportunities many require a background check to volunteer, because UNT SWE often works with minors. If or when this is necessary, this information will be included in the outreach event description.